This is Nikita. The companion of my childhood. The destroyer of fences and killer of turkeys. The best dog who ever lived. I don’t say she was the best dog because she was perfect. Far from it. We lost count of the number of times she ran away by the time she was four years old. She once chewed a gigantic hole in the side of our tent. She ate our garden hose. I don’t think she once sat on command without a Milkbone waved in her face and as for her recall… Non-existent. The second she got off leash she was gone. The only thing left to do was trudge home to call Animal Control. Nikita wasn’t perfect. She wasn’t even obedient. But she was there when I needed her; she never judged me when I cried. She was always up for a game or a walk. She never scolded and she gave warm, fuzzy hugs. Not matter how many times we lost her, she always found her way home. I’ve been meaning to write about her for a long time. The dog of my youth, the dog who will remain ensconced in my golden memories forever. Not a day goes by when I don’t think of her. Unfortunately, it is still hard for me to put these thoughts into words without tearing up. 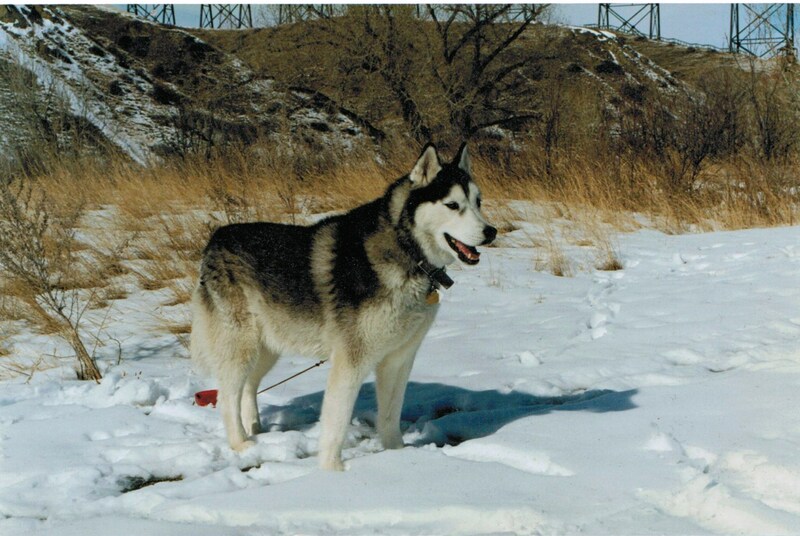 Nikita lived a long time for a purebred Siberian. Born January 14th, 1988, she lived each day to the fullest until February of 2005. Those seventeen years went by much too fast. Those seventeen years were not long enough. As I was only six when we brought her home as a puppy, Nikita was more my father’s dog than mine. He was the one taking her to obedience classes and working with her on proper leash walking. He was the one who got up throughout the night when she howled from her space in the kitchen. Training methods in the late eighties were primarily dominance-based. It’s just how it was. But I don’t think my parents ever felt entirely right about the choke collar they were told to purchase. After the first six months it was put away, along with any thoughts of teaching the dog any skills. Nikita lived the rest of her life doing pretty much whatever she wanted. Luckily, Nikita’s nature was not troublesome. She adored all children and other dogs. If a stranger came to the house, she immediately welcomed him as her new best friend. I don’t remember hearing her bark more than once in her entire life. We used to joke she was the world’s worst guard dog. Unlike Shiva, her unlimited energy did not translate into constant pacing and attention-grabbing. When in the house, Nikita would settle on her bed, content to watch us hurry around her. Not that she spent much time in the house. She was an outdoor dog through and through. I distinctly remember my father chasing her around the backyard during a blizzard, trying to get her to come back in. The only weather that would induce Nikita to seek shelter was the rain. There was only one thing Nikita feared, and that was thunder. This fear only grew as she aged. Fireworks were just as bad. Kids in our neighbourhood used to set them off at random, which would drive her crazy. We’d built her an eight-foot high dog run in the backyard because she was able to jump our lower fence. One evening fireworks went off and she’d happened to be outside. Nikita had been so freaked out, she jumped the eight feet in an adrenaline-pumped haze. Naturally, if a dog is successful at something once, the dog will do it again and again. Eight feet was no longer tall enough to contain her. There are many stories about the antics, and the charms, of my childhood dog. How she refused to play fetch in preference for tossing the ball and catching it herself. The only game we were allowed to share in was chase. We had to chase her – she would never lower herself to following us. She was ruthlessly independent in all things, and yet patient and full of affection. I can’t think of her older years without large pangs of guilt. I think perhaps this guilt is why I have never fully gotten over her passing. Nikita suffered from arthritis for many of her final years. It slowed her down greatly. Not that she let it stop her. Ever the escape artist, at the age of fourteen I remember her still managing to find a way out of the backyard. I went outside to take her for a walk and she wasn’t to be seen. Noticing the open gate, I walked around to the front of the house and there she was, lying in the shade on the cool grass. One of the regrets I carry is that I didn’t spend more time with her, that I didn’t appreciate her as much as I should have when she was alive. I viewed walking her a chore. Something I needed to get over with so I could go hang out with my friends. It bothers me greatly now that I have put more energy into Shiva in two years than I ever did into Nikita in seventeen. I know I missed out. It’s a loss I have to bear. I try to use my memories of Nikita as a lesson to be more mindful with my current dog. I try to remember to pay attention to the little moments. To enjoy the mistakes and the frustration as much as the laughs and the success. It all passes by much too fast. I don’t want to regret not taking Shiva for just one more walk. In my opinion Nikita was the best dog who ever lived. The best dog I never really knew. Nikita is a big part of making you the awesome dog person you are today. Even the regrets are part of that. Shiva is lucky you loved Nikita so much. I have a similar story with my childhood dog, Snowball. Just as we can’t expect our dogs to be perfect, we can’t always be perfect doggie parents (or siblings as it were during our childhood). But what we can do is treasure our memories and continue to learn with each dog. And I’m pretty sure Shiva takes your learning as a doggie parent to a level you never imagined! One can only hope… Thanks for your kind words. Those childhood dogs will always remain in a class by themselves. But it sounds like, in some ways, Nikita did actually prepare you for The Insanity. Heh, I don’t know about that. Nothing can prepare one for The Insanity. 😉 The two dogs don’t have much in common. Though I like to think they would have been great friends. So many of these things ring true with my two childhood dogs as well. Maybe it’s because they were half husky, but had the nature of a husky more than any other breed I could put a finger on. They also came to us when I was about 8 so I too saw them as more of a chore sometimes. One day I hope to post some photos of them as well, I did a little photo shoot for them before I took them to the vet to go over the rainbow. I’d love to see photos. I wish I had more of Nikita to share. But it was the pre-digital age and all of the photos are still at my parents’ home. This is the only one of her I have. When we’re kids we just think the world will go on forever. So much happens to us then that we appreciate only when they are gone and we have some life experience. Very true. I don’t miss being a kid – perhaps even for that reason alone. Very touching post. I have many of the same regrets and guilt as you do, over my childhood dog. Nikita was a gorgeous Siberian. Thank you for sharing her story with us. Thank you for reading it. I rambled a lot more than I intended. 😛 It’s hard to know quite how to word things after such a long time. All of the stories mix together. Because of the past dogs in my life, I hope I am a better dog owner. Me too. Though I think Shiva has taught me more than any other dog ever could. We often joke that our next dog is going to be awesome. After my Stanley started having health issues, and the years kept ticking by, I realized I wasn’t appreciating the short time we have together. It’s easy to get lost in the shuffle of your days and nights, and forget to appreciate the little moments. Now when my senior, disabled dog dilly dallies on his morning walk, making me late for work…I remind myself to enjoy it. There might not be another morning walk in our future because things can change overnight. I love this post. It’s an insightful, heartfelt tribute to Nikita. You honor her by learning from the experience, and appreciating your time with Shiva even more. A few weeks ago on a walk with Shiva I was getting annoyed with her for trying to eat every single piece of garbage we passed. She kept blowing me off to sniff at wrappers and choke down disgusting things I knew would just make her sick. At the peak of my irritation we passed a neighbour and her dog, Dusty. Dusty is quite old but had been doing fairly well until recently. The neighbour called out to us and said hello to Shiva. I asked how they were and she told me Dusty wasn’t so healthy, that she is now completely deaf and the vet doesn’t think she has long. As I walked away I was struck by how fast the time passes. Not too far away from now, that could be me and my dog. My irritation with Shiva’s garbage eating seemed so petty. I had several childhood dogs, thanks to divorce and the tough life that farm dogs often live. There were several that stood out above the rest, and I felt that they were the greatest dogs, too. I think the thing about a childhood dog that’s different is that you don’t have all the responsibilities, you sort of grow up together. We learn so many life lessons from dogs, and I think that’s where the real magic of childhood dogs lays. It sounds like Nikita was a fabulous dog to grow up with! “Live each day as though it’s your last” is great for philosophy class, but doesn’t translate into real life. When Shiva pukes up the garbage, it is annoying. That doesn’t mean you don’t love and appreciate her. And you did love and appreciate Nikita, as much as a child of six, ten, or sixteen can. He was, as you say, really your dad’s dog. I have to order my kids to take Our Best Friend outside for a pee, and they spend more time with the computer than with him. But if I suggested giving him away (“You don’t really play with him much, you know, and Mommy does most of the work”) you’d hear their protests in Halifax. I promise. Kids are kids. Don’t beat yourself up. Thank-you for sharing your story of Nikita, it was very sweet 🙂 Every dog we have helps us understand dogs better and better. What a beautiful tribute for a beautiful dog. I have to smile at her abilities and behaviors, they are so Husky. I am so sorry for your loss. We all have regrets of not taking in certain moments or feeling like we didn’t take the time, but I bet Nikita never doubted she was loved. I had a husky growing up too and he was very similar to Nikita. I’ll always remember him as a big part of my childhood too. No matter what your regrets are, I have no doubt that Nikita was well-loved and knew it everyday. Your post choked me up and made me remember so much. I mean, I will always constantly think of Nikita. She was my childhood playmate. I don’t think I’ll ever love a dog in the same way as I did her. I remember her pulling me on a sled, and curling up with her in winter. When she kept my feet warm at the Santa Claus Parade. I remember her pacing in the backyard. You can’t forget that. Ha ha. And how my best friend was so scared of her. I’ll have to scan in some pics of her for you sometime. I know dad has a bunch. I still have regrets with some of my earlier dogs too. For now I console myself knowing I am doing the very best I can for the dogs I do have. What a lovely reminder of your beautiful pet. Those childhood dogs have such an effect on how we treat our dogs today. For me it was Tessa, a doberman from my uncle. I loved that dog and nothing was better than taking her for walks and have fun. My uncle treated her harshly and neglected her and it made me sad. When he gave her up for adoption, the new family visited me and my uncle one time. She was so ecstatic to see us. Even after the way she was treated. It broke my heart. I vowed that if I ever would own a dog, I would take care of them and love them over anything. It then took 25 years before I deemed myself good enough to have a dog. There are to this day not many that go by, without that I think of Tessa. What an amazing post about a beautiful dog, Kristine. My eles welled up reading it. Your love for Nikita could be heard in every thought. Thank you for sharing her with us!